The conditions of the rescue of the 12 soccer teens and their coach from the Tham Luang cave complex back in July were incredibly harrowing, and everyone involved faced the imminent risk of death throughout the ordeal. The players themselves were undoubtedly terrified, but according to a new letter posted to the New England Journal of Medicine, their anxiety was blunted by strategically timed doses of ketamine, an extremely powerful sedative. Dr. Jeffrey B. Gross, chairman of the University of Connecticut’s department of anesthesiology, said that light sedation with ketamine will “basically scramble your brain a bit but won’t put it to sleep.” At some points, the boys may have been able to follow simple directions. But their ability to perform complex maneuvers, such as swimming, would be doubtful, he said. Ketamine is serious business, but there are some fascinating reasons why it’s more suitable for this kind of emergency situation than less severe sedatives. According to the NEJM letter, ketamine “impairs shivering,” and “is associated with smaller drops in core temperature,” which makes it the sedative of choice in situations where hypothermia is a risk. The Times says this quality is due to a unique property of ketamine among sedatives: it constricts rather than relaxes blood vessels, and vasoconstriction slows the flow of blood and helps retain body heat. Ketamine also reportedly doesn’t suppress breathing at moderate doses, although exactly how much was administered is left out of both the letter and the report. 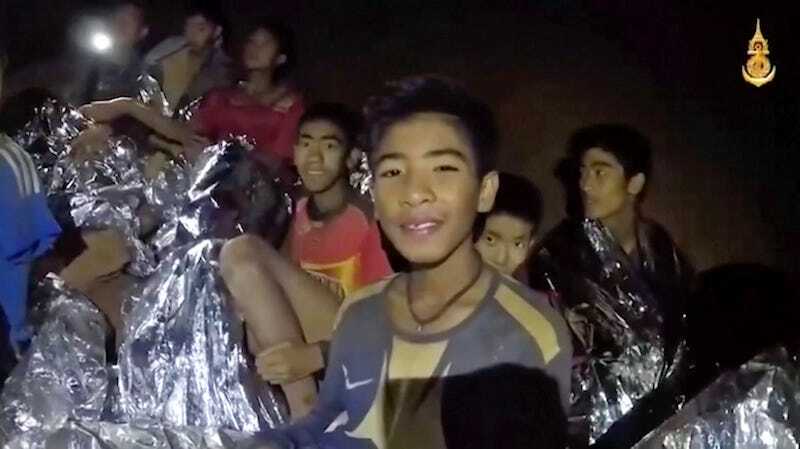 All 12 players and their coach were successfully rescued from the cave complex, with the last boy being safely extracted after a whopping 18 days underground. The NEJM letter is short and bone dry, but I highly recommend the Los Angeles Times report. Go read it.